Who invented Dynamite? The name of the person credited with inventing Dynamite and the detonator is Alfred Nobel (1833 - 1896). Alfred Nobel is not only famous as the Swedish inventor of Dynamite but also as a scientist, engineer, chemist and industrialist. When was Dynamite invented? Alfred Nobel invented Dynamite in 1867, during the Second US Industrial Revolution / Victorian period of invention (1850 - 1914). Definition of Dynamite: Dynamite is defined as an explosive substance containing nitrate sensitized with nitroglycerin that was soaked and absorbed on sawdust, clay, wood pulp or any other type of absorbent material. A protective coating surrounded the explosive material and a fuse was connected to a blasting cap. Fact 1: Who invented Dynamite? The Dynamite was invented by Alfred Nobel in 1867 during the Second US Industrial Revolution era of inventions (1850 - 1914). Fact 2: Who invented Dynamite? Prior to the invention of Dynamite in 1867, there was not a safe way to handle nitroglycerin, a heavy yellow poisonous oily explosive liquid, made by the action of nitric acid on glycerin in the presence of sulphuric acid. Nitroglycerin was an extremely unstable and terribly explosive that led to numerous fatal accidents and explosions that inflicted horrendous injuries. Fact 3: Who invented Dynamite? Working with explosives was dangerous business requiring workers to drill a hole and placing either black powder, aka gunpowder, or liquid nitroglycerin in the opening and lighting a fuse. Fact 4: Who invented Dynamite? Black Powder: Black powder, usually known as gunpowder, was the first chemical explosive invented by the Chinese and described in a military document dated 1044 during the Song Dynasty (960–1279). The basic components of black powder (gunpowder) are saltpeter, potassium nitrate, sulfur and charcoal. Black powder was used by gold prospectors during the California Gold Rush (1848–1855) for blasting, as a military explosive in the American Civil War (1861 - 1865), for building the Transcontinental Railroad (1863 - 1869) and in mining industries. Fact 5: Who invented Dynamite? Nitroglycerine: Nitroglycerin was the first practical explosive produced that was stronger than black powder. In 1847 Nitroglycerin was discovered by the Italian chemist Ascanio Sobrero (October 12, 1812 – May 26, 1888). Ascanio Sobrero had warned vigorously against the use of the volatile Nitroglycerin, because it was so dangerous to handle. Fact 6: Who invented Dynamite? The events of the 1860's, the Civil War and construction of the Transcontinental Railroad, led to the common use of Black powder and Nitroglycerin as explosives. Black powder was used in various weapons such as rifles, pistols and cannons and Nitroglycerin was generally used in construction work. Fact 7: Who invented Dynamite? TNT: Although TNT (Trinitrotoluene) was first invented in 1863 by German chemist Julius Wilbrand (August 22, 1839 – June 22, 1906) it was only originally used as a yellow dye. The explosive properties of TNT were only discovered by German chemist, Carl Haussermann in 1891. Fact 8: Who invented Dynamite? 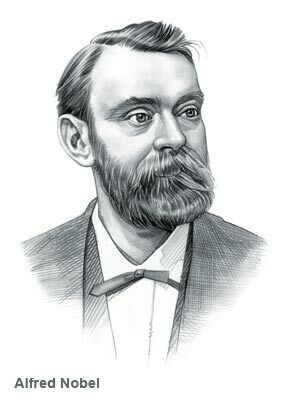 Alfred Nobel wanted to find a safe way to handle nitroglycerin which led to his invention of dynamite. The word Dynamite was derived from the Greek word 'dynamis' meaning "power". Fact 9: Who invented Dynamite? The inventor of Dynamite, Alfred Nobel, was born on 21 October 1833 in Stockholm, Sweden and died on 10 December 1896. Fact 10: Who invented Dynamite? The early years of Alfred Nobel were spent in Stockholm, Sweden where he was raised by his family. He was the third son of Immanuel Nobel, an inventor and engineer and Carolina Andriette Nobel who had eight children. Fact 11: Who invented Dynamite? Alfred Nobel was educated at the Jacobs Apologistic School in Stockholm. In 1837 Nobel's father moved to Saint Petersburg in Russia where he became a manufacturer of machine tools and explosives and was joined by his family in 1842. Fact 13: Who invented Dynamite? Immanuel Nobel became a successful man in Russia and Alfred Nobel benefited by being educated by private tutors. His passions were science and chemistry. Fact 14: Who invented Dynamite? Alfred Nobel continued his studies by traveling abroad. He met Ascanio Sobrero, the inventor of Nitroglycerin, in Paris and then went to the United States to study chemistry and met the inventor John Ericsson, who would go on to design the American Civil War ironclad, the USS Monitor. Fact 15: Who invented Dynamite? The Nobel factory in Russia prospered producing armaments for the Crimean War (1853 - 1856) but his parents returned to Sweden in 1859 leaving their second son, Ludvig Nobel, in charge of the Russian factory. His father opened another armaments factory in Heleneborg, Sweden. In 1864 a terrible disaster struck the family when an explosion at the Nobel factory killed his younger brother, Emil Oskar Nobel, and several other factory workers. Fact 16: Who invented Dynamite? The tragedy made Alfred Nobel determined to find a safer was of handling explosives. In 1866 he discovered that mixing nitroglycerine with silica would turn the liquid into a malleable paste that could be fashioned into a cylinder shape for easy insertion into the drilling holes used for construction and mining. He also invented a detonator, or blasting cap, for detonating the nitroglycerin. Fact 17: Who invented Dynamite? Alfred Nobel succeeded in his goal of producing a safer type of explosive and, in 1867, he patented a mixture of nitroglycerin and an absorbent substance, producing what he named "Dynamite.". The patent number was US 78317 for an 'Improved explosive compound' - Dynamite. Fact 18: Who invented Dynamite? Alfred Nobel went on to improve his invention of Dynamite by changing the detonator so that the dynamite could be ignited by lighting a fuse. In 1875, Alfred Nobel went on to invent blasting gelatine, which was more stable and powerful than dynamite, which was patented on March 22, 1889, patent number US456508. Fact 19: Who invented Dynamite? Alfred Nobel's invention of dynamite and other explosives made him a multi-millionaire. In total, Alfred Nobel held 355 patents in the fields of electrochemistry, optics, biology, and physiology. Fact 20: Who invented Dynamite? Alfred Nobel stipulated in his last will and testament that 94% of his total assets should go toward the creation of an endowment fund to honor the discoveries and achievements of notable men and women whose work helps humanity. Fact 21: Who invented Dynamite? Alfred Nobel died from a stroke on 10 December 1896 and was buried in Norra begravningsplatsen in Stockholm. Fact 22: Who invented Dynamite? Alfred Nobel, the inventor of dynamite, left 31,225,000 Swedish kronor, roughly equivalent to 300 million U.S. dollars, to fund the Nobel Prizes. Nobel Prizes are awarded for science, physics, chemistry, medicine, literature and peace. Who Invented Dynamite - Alfred Nobel - Inventor - Invention - Definition - Meaning - Famous - Important - Dynamite History - Timeline - Innovation - Significant - Development - Dynamite - First - Definition - Kids - Facts - Information - Info - Who invented Dynamite - Dates - When - Why - Impact of Dynamite - Purpose - Use - Dynamite - Amazing - Dynamite - Definition - Meaning - Awesome - Swedish - History - Timeline - Who Invented Dynamite?